There is something very disheartening when you see the results of looting. Objects ripped out of context. Pots broken into fragments. Sculptures smashed. So much damage to supply the market and the appetites of museums and private collectors. Some collectors will claim that they are preserving the past, but really their desire is to own the past (and to ignore the consequences of the "owning" process). 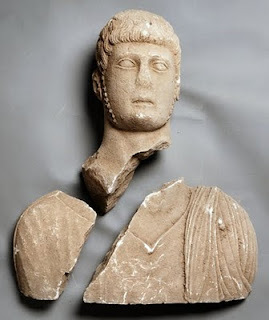 Do auction-houses and dealers care how recently surfaced antiquities arrived on the market? Dirt encrusted Roman limestone funerary bust that passed through the stock of a European dealer. When I was doing an MA in Britain, I recall a conversation with either a colleague or professor who told me about working in Ostia. Some years ago, he/she entered a tomb which was supposed to have been protected only to find it had been broken into. The ground was littered with cigarette butts and bottle caps and there was a also broken chainsaw blade on the floor. The figural relief on a sarcophagus in the tomb had been cut away by means of the chainsaw. Modern chisel and blade marks are apparent on so many sculptural works that enter the market without histories. One might say nauseating.